Cimabue (Italian: ; c. 1240 – 1302), (also known as Cenni Di Pepi or in modern Italian, Benvenuto di Giuseppe) was a Florentine painter and creator of mosaics. 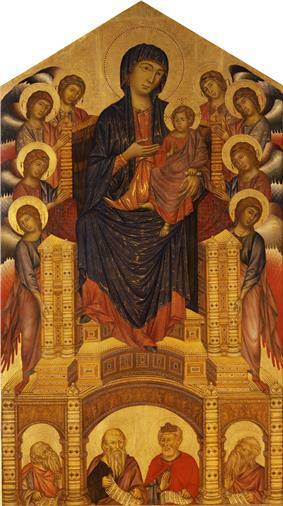 Cimabue is generally regarded as one of the first great Italian painters to break from the Italo-Byzantine style, although he still relied on Byzantine models. The art of this period comprised scenes and forms that appeared relatively flat and highly stylized. Cimabue was a pioneer in the move towards naturalism; his figures were depicted with more lifelike proportions and shading. Even though he was a pioneer in that move, his Maestà paintings evidence Medieval techniques and characteristics. According to Giotto, the first great artist of the Italian Renaissance. Owing to little surviving documentation, not much is known about Cimabue's life. He was born in Florence and died in Lives of the Most Excellent Painters, Sculptors, and Architects. Although it is one of the few early records about him, its accuracy is uncertain. Fresco in the Lower Basilica of Assisi. He perhaps trained in Florence under unknown masters culturally connected to Byzantine art. His first attributed work, the Crucifixion in the church of San Domenico in Arezzo (assigned to him by Italian art historian Pietro Toesca and dated to around 1270), departed from the Byzantine style. His style was at the time more reminiscent of works such as the Christus patiens (c. 1250) by Giunta Pisano, although Cimabue's Christ is more bent and the clothes have the golden striations introduced by Coppo di Marcovaldo. Around 1272 he is documented in Rome. A little later, he made another Crucifixion for the Florentine church of Santa Croce (incidentally: damaged by the 1966 Arno River flood). This is a larger and more evoluted work than that in Arezzo, with traces of naturalism perhaps inspired by Nicola Pisano's works. In the same period (c. 1280) he painted the Maestà now at the Louvre Museum, originally in the church of San Francesco at Pisa. This work established a style which was followed by numerous artists after him, including Duccio di Buoninsegna in his Rucellai Madonna (once wrongly attributed to Cimabue), as well as Giotto himself. Other works dating to this period, in which the influence of his pupil Giotto becomes manifest, include a Flagellation (Frick Collection), mosaics for the Baptistery of Florence (now largely restored), the Maestà at the Santa Maria dei Servi in Bologna and the Madonna in the Pinacoteca of Castelfiorentino. A workshop painting, perhaps assignable to a slightly later period, is the Maestà with Saints Francis and Dominic now at the Uffizi. 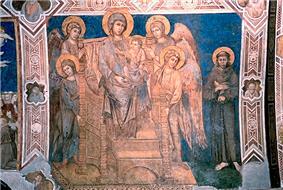 During the pontificate of Pope Nicholas IV, the first Franciscan pope, Cimabue worked at Assisi. His call was perhaps due to the fame he gained in Rome in 1272, although no works from his stay there are known. At Assisi, in the transept of the Lower Basilica of San Francesco, he frescoed a Madonna with Child Enthroned, Four Angels and St. Francis; the left part of the work is missing, and perhaps showed St. Antony of Padua. The authorship of the painting has been recently disputed for technical and stylistic reasons, however. Cimabue was subsequently commissioned the decoration of the apse and the transept of the Upper Basilica of Assisi, in the same period in which Roman artists were frescoing the nave. The cycle comprises scenes from the Gospels, the life of Mary and of St. Peter and St. Paul, and is today in poor condition due to the oxidation of the brighter colors. Crucifix, 1287–1288, Panel, 448 cm × 390 cm (176.4 in × 153.5 in), Basilica di Santa Croce, Florence. The Maestà of Santa Trinita, originally painted for the church of Santa Trinita in Florence dates to c. 1290–1300. It is now at the Uffizi Gallery. The softer expression of the characters suggests that it was influenced by Giotto, who was by then already active as a solo artist. Cimabue spent the period from 1301 to 1302 in Pisa, where, together with collaborators, he executed the apse mosaic for the city's cathedral. He died in 1302. History has long regarded Cimabue as the last of an era that was overshadowed by the Italian Renaissance. As early as 1543, the historian Vasari wrote of Cimabue, "Cimabue was, in one sense, the principle cause of the renewal of painting," with the qualification that, "Giotto truly eclipsed Cimabue's fame just as a great light eclipses a much smaller one." ^ a b Vasari, G. Lives of the Artists. Translated with an introduction and notes by J.C. and P Bondanella. Oxford: Oxford University Press (Oxford World’s Classics), 1991, pp. 7–14. ISBN 978-0-19-953719-8. ^ Fred Kleiner (2008). Gardner's Art through the Ages: A Global History. Vol. 2. Cengage Learning EMEA. p. 502. ^ Vasari, Giorgio (Reprinted 1991.). Lives of the Artists, 1550. Oxford: Oxford University Press. p. 13. Adams, Laurie Schneider (2001). Italian Renaissance Art. Boulder, Colorado: Westview Press. p. 420. Vasari, Giorgio; translation by George Bull (1987). Lives of the Artists. Penguin Classics. Vaughn, William (2000). Encyclopedia of Artists. Oxford University Press, Inc.